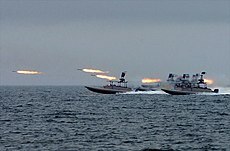 The Islamic Revolutionary Guard Corps (IRGC) (Persian: سپاه پاسداران انقلاب اسلامی‎, translit. Sepâh-e Pâsdârân-e Enghelâb-e Eslâmi, lit. 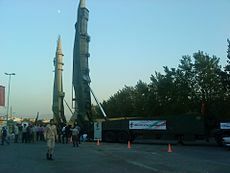 'Army of Guardians of the Islamic Revolution' or Sepâh for short) is a branch of Iran's Armed Forces, founded after the Iranian Revolution on 22 April 1979 by order of Ayatollah Khomeini. Whereas the Islamic Republic of Iran Army defends Iran's borders and maintains internal order, according to the Iranian constitution, the Revolutionary Guard (pasdaran) is intended to protect the country's Islamic republic system. The Revolutionary Guards state that their role in protecting the Islamic system is preventing foreign interference as well as coups by the military or "deviant movements". Major General Qasem Soleimani (Quds Force) General Suleimani was responsible for negotiating several accords between Iraqi political figures. This page is based on the Wikipedia article Islamic Revolutionary Guard Corps; it is used under the Creative Commons Attribution-ShareAlike 3.0 Unported License (CC-BY-SA). You may redistribute it, verbatim or modified, providing that you comply with the terms of the CC-BY-SA.